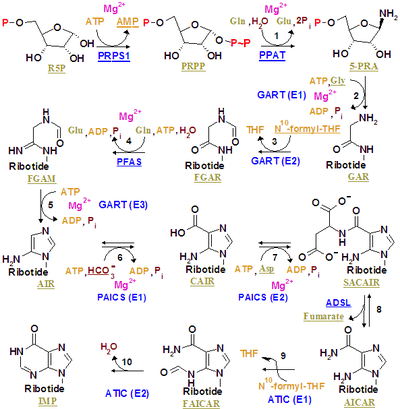 Purines are biologically synthesized as nucleotides and in particular as ribotides, i.e. bases attached to ribose 5-phosphate. A key regulatory step is the production of 5-phospho-α-D-ribosyl 1-pyrophosphate (PRPP) by ribose phosphate pyrophosphokinase, which is activated by inorganic phosphate and inactivated by purine ribonucleotides. It is not the committed step to purine synthesis because PRPP is also used in pyrimidine synthesis and salvage pathways. The first committed step is the reaction of PRPP, glutamine and water to 5'-phosphoribosylamine (PRA), glutamate, and pyrophosphate - catalyzed by amidophosphoribosyltransferase, which is activated by PRPP and inhibited by AMP, GMP and IMP. In the second step react PRA, glycine and ATP to create GAR, ADP, and pyrophosphate - catalyzed by phosphoribosylamine—glycine ligase (GAR synthetase). Due to the chemical lability of PRA, which has a half-life of 38 seconds at PH 7.5 and 37 °C, researchers have suggested that the compound is channeled from amidophosphoribosyltransferase to GAR synthetase in vivo. The third is catalyzed by phosphoribosylglycinamide formyltransferase. The fourth is catalyzed by phosphoribosylformylglycinamidine synthase. The fifth is catalyzed by AIR synthetase (FGAM cyclase). The sixth is catalyzed by phosphoribosylaminoimidazole carboxylase. The seventh is catalyzed by phosphoribosylaminoimidazolesuccinocarboxamide synthase. The eight is catalyzed by adenylosuccinate lyase. The ninth is catalyzed by phosphoribosylaminoimidazolecarboxamide formyltransferase. The last step is catalyzed by Inosine monophosphate synthase. In eukaryotes the second, third, and fifth step are catalyzed by trifunctional purine biosynthetic protein adenosine-3, which is encoded by the GART gene. Both ninth and tenth step are accomplished by a single protein named Bifunctional purine biosynthesis protein PURH, encoded by the ATIC gene. ↑ "Substrate specificity of glycinamide ribonucleotide synthetase from chicken liver". The Journal of Biological Chemistry. 271: 8192–5. April 5, 1996. doi:10.1074/jbc.271.14.8192. PMID 8626510. ↑ Ansari MY, Equbal A, Dikhit MR, Mansuri R, Rana S, Ali V, Sahoo GC, Das P (Nov 2015). "Establishment of Correlation between In-Silico &In-Vitro Test Analysis against Leishmania HGPRT to inhibitors". International Journal of Biological Macromolecules. 83: 78–96. doi:10.1016/j.ijbiomac.2015.11.051. PMID 26616453.